The “IceMan” Wim Hof famously preaches “The limit is not the sky. The limit is the mind.” For those unfamiliar with the Dutchman, let me tell you about him. He hiked Everest in just shorts, ran a marathon in the Namib desert without drinking water, and routinely takes 2 hour ice baths. Okay, so those things sound pretty cool, but what’s the purpose behind this suffering? Well, since you asked, we’re gonna dive deep into why the cold will change your life. Firstly, the ability to overcome the fear of discomfort shouldn’t be under-valued. We live in a world where we are spoiled with climate-control. Thanks to the modern luxuries of A/C, heaters, seat warmers, and clothing, we are rarely put in a situation that requires us to be extremely cold or hot. This is why me must take the initiative to get cold AF and take our mind and body to the next level. There are countless benefits of doing so, but for the sake of human’s short attention spans, we’ll focus on three reasons why you NEED to get comfortable with the cold. 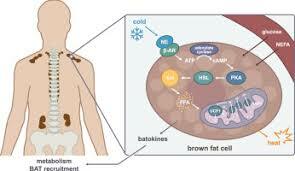 1) Weight Loss: Cold Exposure activates our brown fat cells. Unlike our white fat that stores energy, brown fat actually burns calories to create heat in the body. After we expose our bodies to extremely cold temperatures, our body uses our small amounts of brown fat to create warmth for survival. The leaner somebody is, the more brown fat that they have. Brown fat is typically located in the sides of the neck, the region just above the collarbone, the upper back between the shoulder blades and along the sides of the upper spine. Some simple ways to activate brown fat throughout the day are by working out and/or sleeping in cold environments, 60 degrees or below, and of course, some cold showers (we’ll come back to this later). Here is a diagram of where our brown fat is located. It's important to activate these areas before and during our cold exposure. This brown fat also helps speed up metabolism, which studies suggest increases by 300%, when spending time in a 55-degree environment, which is a pleasurable day for most Americans. This uptick in metabolic efficiency will dramatically aid weight loss. While lack of physical activity is a huge reason for obscene Obesity and Diabetes rates, poor nutrition and lack of cold exposure are also huge contributors. 2) Bye Bye Inflammation: Unless you’ve been hiding under a rock, you probably heard that inflammation drives disease. That inflammation comes from poor nutrition (mostly sugar and gluten), lack of recovery (poor sleep and rest), and too much sitting. If you needed to be reminded about the dangers of sitting, click here. Heart disease, stroke, cancer, type 2 diabetes, obesity, and arthritis are torturing and killing more people than ever before, and it’s all because of inflammation. Cleaning up our nutrition with anti-inflammatory foods is the most effective way at reversing the effects of inflammation. However, exposing ourselves to cold temperatures raises adiponectin, which is a protein that helps fight inflammation. In addition, when you apply ice to the body, it constricts blood vessels and reduces blood flow to the given area, and pain, swelling, and inflammation decrease. This video is from the Wim Hof workshop in West Palm Beach. I highly recommend attending and checking out www.wimhofmethod.com for more breathing and cold therapy tutorials. 3) Happy Hormones: “’A 2007 study published by a molecular biologist named Nikolai Shevchuk found evidence that cold showers can help treat depression symptoms, and, if used regularly, might even be more effective than prescription antidepressants.” This is likely in part due to the adrenaline release that is proven to fight off depression. Furthermore, our brain release dopamine and serotonin when we feel a sense of accomplishment, which make us happy. O yeah, and for all of my dudes out there, a study from the Thrombosis Research Institute found that cold exposure also increases testosterone. So if you weren’t already convinced to hop in a cold shower or ice bath, I hope that more energy and erections are the answer! I’ve personally been implementing cold showers every morning for almost a year now. They have been so helpful, that they are one of the five things that I do to Master the Morning. In addition, I always hop in the cold plunge whenever the opportunity arises, which isn’t often enough. I was ready to level up and find a better way to utilize the cold for all of its benefits. I signed up for the Wim Hof workshop in June 2018, which would be the first time I’d experience an ice bath. Fearful at first, our instructor Dr. Trisha Smith taught us specific breathing and warming techniques to survive and thrive in the cold AND activate our calorie-burning brown fat tissue, as seen in the video below. Here are some of the movements we did before and after we entered the ice bath. The primary focus was to activate our brown fat and get our big muscles moving (back, glutes, legs). We also were syncing each move with our breathe. These tactics made the ice much more manageable. All of this information is awesome, but it’s completely useless if we don’t implement it in our daily lives. So start today…or tomorrow if you’re reading this while you’re falling asleep in bed, which is a no-no! Maybe it’s putting your shower at a slightly colder temperature each day until you adapt to the coldest setting. Or start off with 15 seconds of cold water today, and 30 seconds tomorrow. It’s all about small, incremental changes that will reap BIG rewards down the road. I’m not diving deep into the different methods of cold exposure, but nothing beats an ice bath. Cryotherapy has become popular in the last decade, but doesn’t allow exposure to our hands, feet and head, which limits the benefits. There are also some skeptics on the potential harm that nitrogen gas may have. Search your local area for any gyms or spas with a cold plunge, and try to use it on a weekly basis. Get started on your cold exposure journey now and message us here if you have any follow-up questions or feedback!